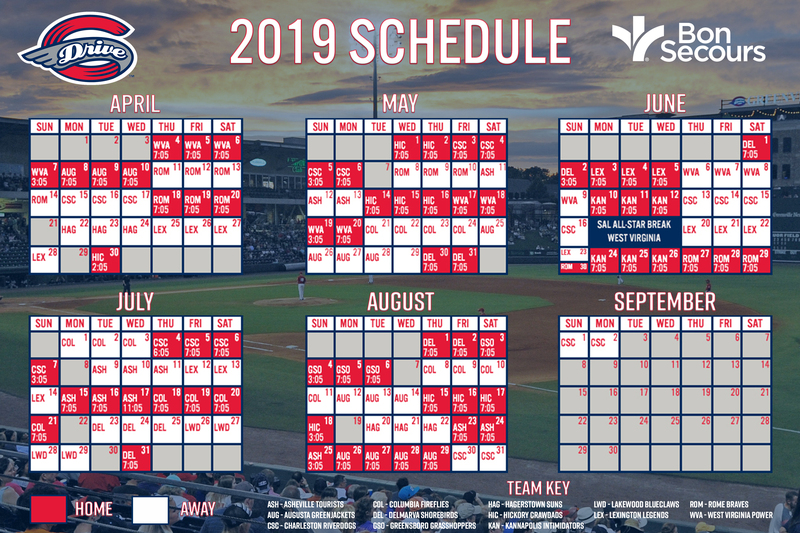 Greenville, SC - With less than one month until the return of baseball to Downtown Greenville, the Greenville Drive are excited to announce that tickets are now on sale for all 2019 college and high school games at Fluor Field. Highlights of this year's amateur schedule include the return of the Reedy River Rivalry presented by ScanSource, featuring the Clemson Tigers and South Carolina Gamecocks, the First Pitch Invitational, the 2019 Southern Conference Baseball Championship, and appearances by some of South Carolina's top high school programs. "We are thrilled to announce the details of the 2019 College Baseball Series, which features elite teams from across the country in our most robust college schedule to date at Fluor Field," said Drive General Manager Eric Jarinko. "This is a great way for our fans to see a number of talented young players before they become household names in professional baseball, while getting ready for another successful season of Drive baseball." Tickets for all college games not involving Clemson or South Carolina will be $9, and those tickets are general admission. Tickets for games involving Clemson or South Carolina will be sold at regular tiered pricing ranging from $8-$12, but tickets for the Reedy River Rivalry can only be purchased through the ticket offices of Clemson and South Carolina. All tickets for high school games at Fluor Field are $7 general admission tickets. Fans can purchase tickets or get more information by calling the Fluor Field box office at (864) 240-4528 or by CLICKING HERE. College baseball's best rivalry returns to Fluor Field on Saturday, March 2nd at 1:00 PM, as the Clemson Tigers will take on the South Carolina Gamecocks in the Reedy River Rivalry presented by ScanSource. Both of these perennial powers will feature plenty of new faces among their 2019 rosters, meaning fans at Fluor Field will see new heroes emerge in this hotly contested matchup. "There is no better way to welcome baseball back to Fluor Field than by hosting the Reedy River Rivalry in front of the two best fanbases in college baseball," noted Jarinko. "Clemson's Monte Lee and South Carolina's Mark Kingston are both outstanding head coaches who understand the significance of this rivalry series to the state, and they will bring two incredibly talented teams ready to win." The Reedy River Rivalry has produced record-breaking attendance numbers during its time in Downtown Greenville, highlighted by an attendance of 7,460 in 2017, which still stands as the highest attended game in Fluor Field's history. The ticket distribution is split 50/50 between both schools, and each game between the schools at Fluor Field has been sold out. This will be the ninth matchup between Clemson and South Carolina at Fluor Field, and each team has won four games apiece. The day after the Reedy River Rivalry, Fluor Field will host the Furman Paladins and the Wake Forest Demon Deacons at 4:00 PM on Sunday, March 3rd. The matchup will be Furman's first of six regular season contests at Fluor Field, and Wake Forest will be making their debut in Downtown Greenville. Furman and Clemson will return to Fluor Field for a midweek matchup on Tuesday, March 5th at 6:00 PM. The First Pitch Invitational runs from Friday, March 8th through Sunday, March 10th, and five teams will participating, making it the largest field in First Pitch Invitational history. Furman will be joined for the weekend by the Michigan State Spartans, the Appalachian State Mountaineers, the Ohio State Buckeyes and the Western Carolina Catamounts. Ohio State is the only team in the field making their first trip to Fluor Field. Friday's action kicks off at 3:00 PM with Western Carolina taking on Michigan State, followed by Ohio State against Furman at 7:00 PM. Saturday's tripleheader features Western Carolina against Appalachian State at 10:00 AM, Furman against Michigan State at 2:00 PM, and Ohio State against Michigan State at 6:00 PM. On Sunday, the action kicks off with a 9:00 AM first pitch between Appalachian State and Furman. Appalachian State will play Michigan State at 1:00 PM, and Ohio State and Western Carolina conclude the weekend with a 5:00 PM game. The North Greenville Crusaders, the preseason #1 team in Division 2, will play at Fluor Field against the Queens Knights on Tuesday, March 12th. Queens is in their first year as a varsity baseball program, and their head coach is Jack McDowell, the 1993 American League Cy Young Award winner. Michigan State will continue its stay in Greenville the weekend of Friday, March 15th through Sunday, March 17th with a four-game series against the UConn Huskies. Friday's action begins at 5:00 PM, and the teams will play a doubleheader on Saturday beginning at 1:00 PM. Sunday's game begins at 11:00 AM. Furman and South Carolina will meet for their annual midweek matchup in Downtown Greenville on Tuesday, March 19th at 6:00 PM. The first high school game of the 2019 season at Fluor Field is on Thursday, March 21st at 6:00 PM, featuring the Riverside Warriors against the J.L. Mann Patriots. On Saturday, March 30th, Fluor Field will host a doubleheader featuring two high school programs from the Upstate and two from the Midlands. The Wren Hurricanes will play the Lexington Wildcats at 1:00 PM, and the second game will feature the Mauldin Mavericks against the Blythewood Bengals at 4:00 PM. Fluor Field will host another high school game on Friday, April 12th at 6:00 PM as the Greenville Red Raiders face off against the Eastside Eagles. The College Baseball Series concludes with the 2019 Southern Conference Baseball Championship from Tuesday, May 21st through Sunday, May 26th. The Samford Bulldogs defeated the Mercer Bears on Championship Sunday in 2018 to earn an automatic bid to the NCAA Tournament. Three in-state programs will participate in the tournament - Furman, The Citadel Bulldogs, and the Wofford Terriers, while Samford and Mercer will be joined by four other out-of-state programs - the ETSU Bucs, the UNCG Spartans, the VMI Keydets and the Western Carolina Catamounts. CLICK HERE to purchase your tickets to the 2019 amateur games at Fluor Field. You can also purchase by visiting the Main Street Box Office or by calling (864) 240-4528.